Well that was a good antidote for the disappointment of Sunday. Saints really took the game to Team Franchise, right from the off and didn't let up all game. Two goals each for Jay Rodriguez, Sadio Mané and Shane Long. Job done. Villa at home next. The team looked very attacking, but the thing that caught my eye was the name Ramírez on the bench. I was under the impression that he had played his last game for the club, but it seems not. Long before he came on as a 65th minute substitute, the Saints fans at the game were chanting his name. The first goal was not long coming. In the fifth minute Jay Rodriguez went on one of his direct challenging runs that we used to see before his injury. He finished with a sublime curling shot into the corner of the net and it was 0-1. Within another five minutes it was 0-2 as Mané charged into the penalty area and with a lovely right footed chip past the keeper, scored his first goal of the night. Appalling defending though. There was then a long wait, until the 25th minute for the next goal, when JRod turned provider by crossing across the face of goal to Mané, who turned and sent a lovely left footed shot into the back of the net. 0-3. That was it on the goal front until after half time. 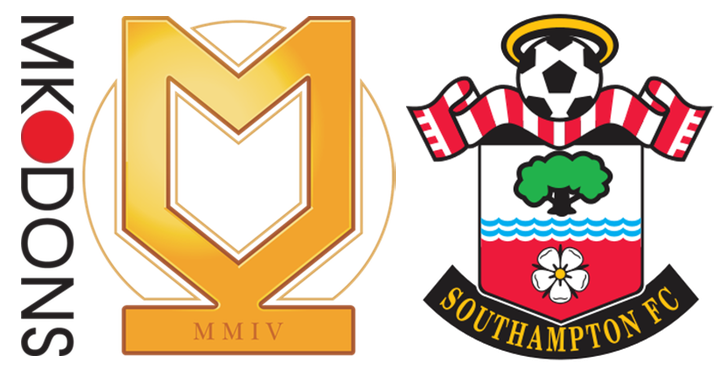 Almost from the kick-off Saints drove at the MK Dons defence and Mané played back to Cédric from the byline. He steadied, looked up and played a wonderful cross into the box, where Shane Long was unceremoniously hauled to the ground. Penalty. JRod stepped up and slammed it straight down the middle with the goalie diving to the left. 0-4. Shortly after this came the welcome sight of Ryan Bertrand making his first appearance this season, when he came on in place of Matt Targett. Bertrand has obviously had no pre-season and will no doubt take a while to get up to speed, but 35 minutes here, in a match that was already won, can do him no harm at all. The next goal had more than an element of comedy to it. A beautiful pass over the top of the defence from Ramírez, who had only just come on for Mané, fell right at the feet of Juanmi, who squared it for the lurking Long and JRod. A defender got a foot to it, but only succeeded in hitting Long on the chest and the ball rebounded into the net. 0-5. The last goal, on 75 minutes came from an exquisite through ball from Davis, right to the feet of Shane Long, who ran on and slotted the ball past Martin in the Dons goal. 0-6. Although the MK Dons were pretty poor, there were plenty of positives to take from this match. The goals for the strikers were welcome. 6 goals from 8 shots on target. That is more like it. I noticed that Mané scored with both left and right feet. I feel that this could be a really great season for him. The defence was hardly tested, which probably gave Cédric the room to impress going forward. I like his ball control. Van Dijk is more than just a defender. His free kick was not so far away. The midfield was organised with an iron fist by Romeu (What a snip he looks. Cheers Chelsea), assisted by Davis and Juanmi. Gastón came on and looked effective, will we be seeing him more regularly this season? But, the best thing was the way the front three moved around. Mané in particular, is looking virtually unplayable at the moment. Even when several goals ahead, Saints didn't let up. No wonder Ron was purring after the match.